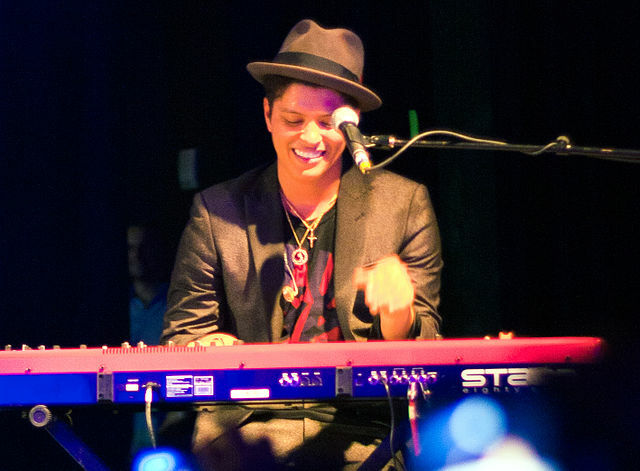 Bruno Mars playing keyboards at a Houston concert in 2010. Photo: Brothers Le and Wikipedia. We’re in the last month of the summer season, and it promises to be a month of musical bliss. There hasn’t been many mega shows this summer. The biggest act this month is Bruno Mars, who is in concert at PPG Paints Arena. There are, however, a steady stream of high-quality, mid-size acts. Like Twang-rock? Florida Georgia Line is at KeyBank Pavilion. Classic rock is prominent with shows from Foreigner/Cheap Trick/Jason Bonham Led Zeppelin Experience, also at KeyBank. There’s a Yestival at Greensburg’s Palace. What’s a Yestival, you ask? It’s a mini-festival with Yes, Todd Rundgren, and Carl Palmer. Tesla, Chris Robinson Brotherhood, and The Outlaws also have Pittsburgh dates. Two outstanding performers who were once a couple, but never performed together until this year, are playing our region: Judy Collins and Stephen Stills. Other notable concerts include Kings of Leon, Phantogram, The Shins, Social Distortion, and Nickelback. There’s going to be a big funk soul dance party at PPG Paints Arena when Earth, Wind & Fire and Chic take the stage. There’s also a bevy of top Pittsburgh talent performing free, outdoor concerts at North and South Parks. We’ve spotlighted Billy Porter, The Gathering Field and Brownie Mary, and The Commonheart. Many concert options are out there; enjoy our suggestions, or follow your own musical pleasure. Classic rock mainstay Chicago has remained vibrant and popular throughout the decades despite lead singer Peter Cetera leaving the band for a solo career in 1985, personnel changes, and a lack of latter-day chart successes. Why has Chicago remained so popular? The answer is in the music. Every musician is highly accomplished and the band’s big wall of sound brings it all together. Best known for its brassy horn section—which gives extra depth to hits like “25 or 6 to 4,” “Saturday in the Park,” “Just You and Me” “Beginnings,” and “If You Leave Me Now“—Chicago had a longer name at its start in 1967. The rockers called themselves Chicago Transit Authority but were forced to change it … by the Chicago Transit Authority. The band will give a FanJam Postgame Concert, which begins at PNC Park after the Bucs play the Padres in a 7:05 game. 115 Federal St., North Shore. Nickelback performing in Brisbane, Australia in 2012. photo: Thakingdome and Wikipedia. Earth, Wind & Fire is one of the most successful soul/funk bands of the late ’70s and early to mid ’80s. There are many reasons for the band’s success, mainly the musical genius of EWF’s leader, the late Maurice White. White fused musical genres together, including soul, funk, African rhythms, gospel, rock, and jazz. He combined that with a tight band of top-notch musicians, including a horn section, mystical lyrics and staging, and the soaring voice of Philip Bailey. White and Bailey were the two lead singers with Bailey possessing a beautiful falsetto voice with a four-octave range. 1975’s That’s the Way of the World was the band’s first big album and produced the hits “That’s the Way of the World,” “Shining Star,” and “Reasons.” EWF has received 20 Grammy nominations, winning six as a group and White and Bailey garnering two individual awards. White’s brother Verdine is the longtime bassist for the band. KeyBank Pavilion is hosting a classic rock show with Foreigner, Cheap Trick, and the Jason Bonham Led Zeppelin Experience. Veteran rockers Foreigner are famous for power ballads such as “I Want To Know What Love Is” and rockers like “Rev on the Red Line” and “Juke Box Hero.” Mick Jones is the only remaining original member of the band, which started out in 1976 and had a hit with its eponymous, five-times-platinum first album a year later. Their latest major release, Acoustique, came out in 2011, featuring unplugged versions of their classic hits. Foreigner is one of the world’s top selling bands with over 80 million records sold. Yes started out in 1968 performing original songs and reworked covers. Their first two albums were mostly uneventful, and they were even on the verge of being dropped by their record label. Then the band made a dramatic turn into experimental (progressive) rock. A few personnel moves were made, and guitarist Steve Howe joined the main founding members Jon Anderson and Chris Squire. Their fortunes also turned as their next album, The Yes Album, released in ’71, was a breakthrough success. The album reached no. 4 in the UK and no. 40 on the U.S. charts. “Starship Trooper” and “Yours Is No Disgrace” were top songs from the release. The band is known as one of the progressive rock pioneers. The members’ innovative vocal harmonies, guitars, rhythm section, and keyboards left a mark on the music industry despite breakups and reunions. There are currently two Yes outfits: Yes and Yes Featuring Jon Anderson, Trevor Rabin, Rick Wakeman. Yes is lead by longtime band members Howe and Alan White (drums, percussion). The group’s last release was 2014’s Heaven & Earth. Yes was finally inducted into the Rock and Roll Hall of Fame this April. “Can We Still Be Friends,” “Hello It’s Me,” and “I Saw the Light” were three monster hits in the ’70s for accomplished pop rocker Todd Rundgren. A musical composer, performer, and producer who plays many different instruments, Rundgren is a free spirit whose creativity is limitless and songs melodically beautiful. He’s produced top albums for many individuals and groups, including Hall & Oates, Cheap Trick, Patti Smith, and The Psychedelic Furs. Rundgren is currently touring in support of his latest release, White Knight. It is the prolific Rundgren’s 26th studio album. Not once, but twice Stephen Stills has been inducted into the Rock and Roll Hall of Fame, and on the same night! Stills garnered that double accolade through his work with Buffalo Springfield and Crosby, Stills & Nash. In Buffalo Springfield, he teamed up with Neil Young, who has called Stills a genius, and his other bandmates to create the seminal counter-culture song “For What It’s Worth (Stop, Hey What’s That Sound).” After Buffalo Springfield disbanded, Stills joined up with David Crosby and Graham Nash to form CSN. They had a cornucopia of hits including “Helplessly Hoping” and “49 Bye-Byes.” On Stills’s self-titled, first solo album, he had some help on guitar from Jimi Hendrix and Eric Clapton, and Ringo Starr assisted on drums (credited only as Richie!). Stills has also been a member of the bands Manassas and most recently The Rides. 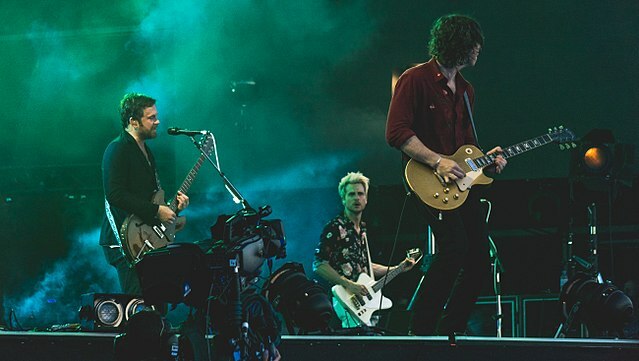 Kings of Leon in action earlier this year. photo: Raph_PH and Wikipedia. Rick Handler is the executive producer of Entertainment Central and enjoys great music. Christopher Maggio is a writer and editor who likes seeing great concerts.